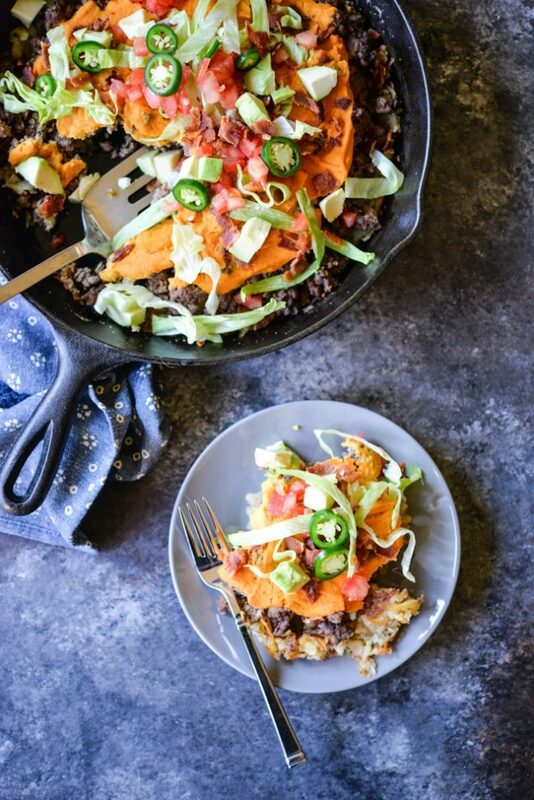 This Paleo Cheeseburger Casserole is an epically delicious, healthy meal the whole family will love! It's made with a layer of crispy hash browns, seasoned burger, a dairy-free cheese sauce, and fresh toppings. When I was pregnant, I had a few friends tell us that we needed to watched as much television as possible because there would “be no time for that when baby arrives!” I'll admit that, while I do enjoy slowly chipping away at a series after dinner with my hubby, I'm not that big of a TV-watcher. I'm more of an audiobook/podcast gal because I can listen while also grocery shopping, cleaning, doing yard work, etc. So I mostly ignored the watch-all-the-TV advice and used our pre-baby time to keep working on my business. Flash forward to her arrival and I'm now SO GLAD I didn't pre-watch everything of interest. Now, maybe our experience is a unique one, but good golly …I haven't ever had so much time in front of the TV IN MY LIFE! There isn't much else I can do while nursing this sweet little cluster feeder of mine, so I've been devouring Netflix between phone calls to friends and family members. Though we're becoming more and more mobile by the day (as I get the hang of baby-wearing), we still have a fair amount of couch time. ALL THIS brings me to my question! As I chip away at shows, I'd love to know what you're watching and loving. I'm currently swimming in the DEEP pool of Gray's Anatomy episodes, but would love to mix it up a bit. I love a good range of genres from comedies, to documentaries, crime dramas, etc. Some of my favorite shoes in the past have been Jane the Virgin, Peaky Blinders, Black List, New Girl, OITNB, House of Cards, Gilmore Girls, etc. …just to give you an idea of what I've watched! 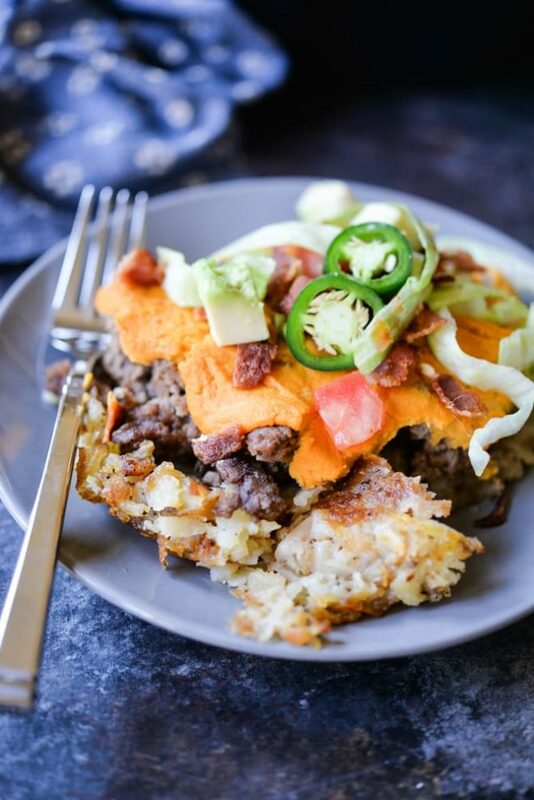 Ok, now let's talk Paleo Cheeseburger Casserole! It's no secret that I LOVE BURGERS. A giant burger with french fries was my first meal after Gray's delivery and I crave one at least once a week. While I prefer my burger bun-less (lettuce-wrapped, instead), I do still like all the fixings. 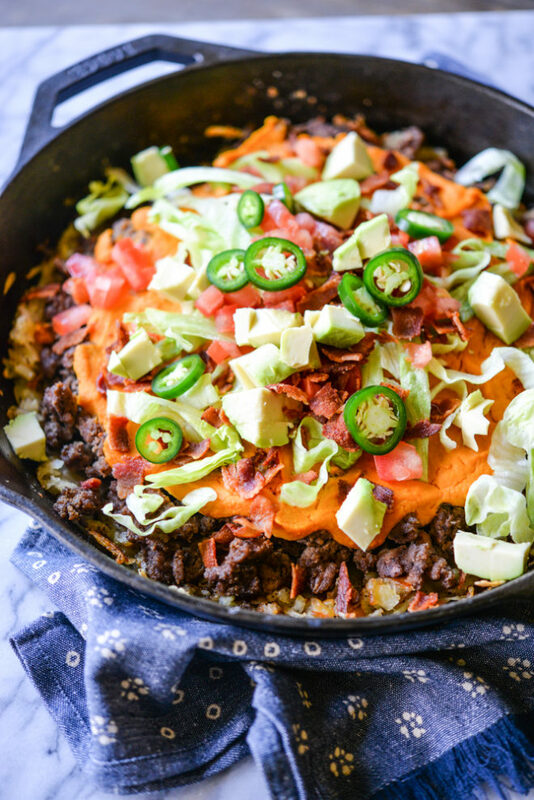 This casserole is fashioned after my favorite meal …made even more epic by a Paleo-friendly “cheese.” The casserole starts off with a crispy layer of hash browns (to replace the fries), a layer of seasoned “burger,” and a layer of (really easy) Paleo cheese. All you need to do is assemble, bake so that the flavors come together a bit, and top with your favorite fresh bonus fixings. Spoon up your servings and enjoy! Here's the recipe video with step-by-step instruction, enjoy! 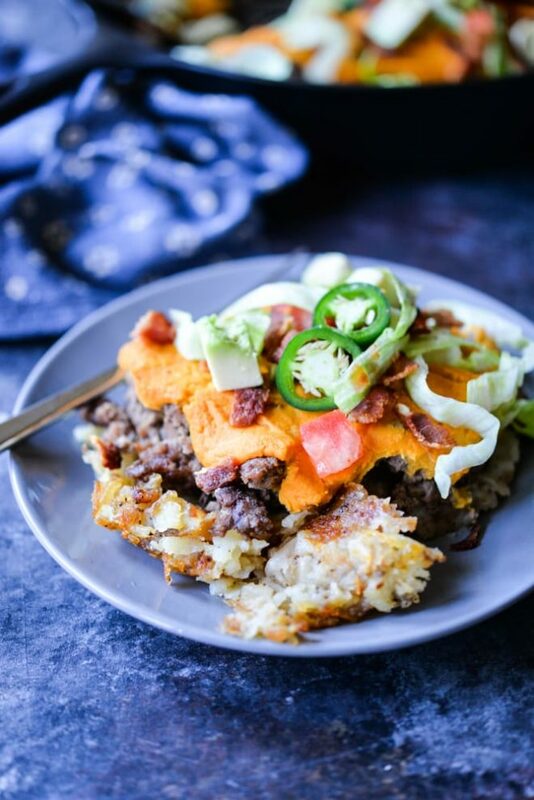 NOTE: this Paleo Cheeseburger Casserole freezes really well if you're looking to bulk up your freezer meals! In a 13-inch cast iron pan, or 9×13 inch oven-safe pan, heat the oil over medium heat, add the diced onions and garlic and saute 5 to 7 minutes, until onion is translucent. Add the ground beef, salt, and pepper, and cook 7-8 minutes until ground beef is browned and fully cooked. Remove from pan. Add the 3 tablespoons oil to the pan, then add hash browns. 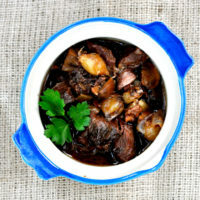 Cook 5 to 6 minutes, then flip, and cook an additional 3-4 minutes, or until the potatoes are crispy and cooked through. Place the ground beef and onion mixture on top of the hash browns, then pour on the nacho cheese. Put the pan in the oven and bake for 15 minutes. While casserole is baking, prepare the toppings. Once casserole has finished baking, garnish with the lettuce, bacon, tomato, avocado, and jalapeno and serve! 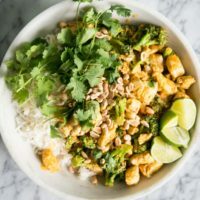 Ummmm…this recipe is going to the top of my menu for next week! It looks so good!! As far as tv shows- if you liked New Girl then I recommend Young and Hungry and also Baby Daddy! Both are silly and cute! Have you watched The Crown yet?! If not, it’s a must see!!! Also, When Calls The Heart is a great one to watch too 🙂 And oh this recipe looks yummy! I can’t wait to try it! I would definitely recommend Scandal! I had the same experience with my girls! Lots of binge watching while snuggling. If you have amazon prime Sneaky Pete and Goliath are 2 really good shows. I second the The Crown, great show! Hi! I watched so much tv while nursing too! Definitely the most tv I have ever watched in my life in such a short period of time. Some shows that I watched and loved during the first few months were How to Get Away with Murder, Life in Pieces (short episodes and easy to watch), Glitch, and Travelers. Agree above with Young and Hungry – but Netflix just released the third season of Crazy Ex Girlfriend. Wikipedia describes it as a “romantic musical comedy-drama television series” and it’s absolutely wonderful. Also, this meal is definitely happening next week in our household. YUM! Many moons ago i binge watched reruns of Seventh Heaven and supermarket sweep (pre netflix) while nursing my 2 oldest. Call the Midwife and Stranger Things are my current favorites. Enjoy the time with that sweet baby! If you haven’t already, I definitely recommend watching Parenthood! You’ll laugh, you’ll cry…it’s the best!! Ugh I agree that “Parenthood” is SOOOO good! One of my favorites! The Crown. How to Get Away With Murder. Royal Pains (a medical show that is actually smart and entertaining!) Master of None. OH and how could I forget!! Madam Secretary is also wonderful. I enjoyed the docuseries Dark Money. And second (third, fourth?) the suggestion for The Crown. Call the Midwife is also a nice, pleasant little show. Godless was great too but it’s not everyone’s taste. Handmaid’s Tale was also great if you’re up for some Hulu viewing. 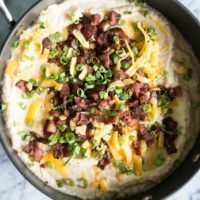 I saw this recipe get posted and I decided I needed to make it ASAP! So that’s what I did. It was fantastic and pretty dang easy to make! This was also my first time making Fed & Fit’s paleo ‘cheese’ and let me tell you…we will be make it again. So. Good! So glad you liked it Tayler! Going to make this tonight!! Can’t wait!! Hart of Dixie is the show I binged when my little guy was actually still little!! It’s similar to Gilmore Girls in that the town plays such a huge role in the show. Those two shows are my fave so I highly recommend Hart of Dixie if you like Gilmore Girls. Also Queer Eye just released on Netflix and it’s such an uplifting show. I cried several times watching it. Thank you for a great recipe, can’t wait to try it out! A couple tips for anyone who hasn’t made this yet but plans to. I cooked the bacon first, and then used the bacon fat to saute the onions and garlic, plus the meat. Also, this is a LOT of meat! I used my largest skillet (13″), but after the meat was finished cooking I decided to reserve about half of it for another recipe. I don’t think I could have made this in my regular cast iron skillet (9″) but would love to hear if anyone else did! 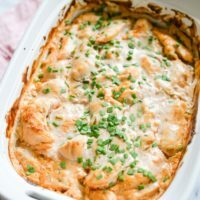 Looking forward to eating this tonight and seeing how much my husband and toddler enjoy it! This was so so so delicious. I’m wondering if anyone has any tips for getting their hashbrowns crispy. I can never quite do it right! Hey Alyssa! Patience is key. You really have to let the hash browns sit and cook for a while, then take a peek and see if they are browned, then flip. The other key to this is plenty of oil, and a good non-stick pan. Hart Of Dixie! It’s in Netflix and you’ll love it! I’m not a TV gal either but I watched a lot on during the first few months. This was SO good!! I only wish I’d made more for leftovers! The Crown, Hart of Dixie, Crazy ExGirlfriend and I loved the Marvelous Mrs. Maisel on Amazon Prime. Also the movie Set it Up on Netflix. Oh my gosh! This looks great. Thank you for always having meals that my husband and daughter are willing to eat. It makes life as a working mom so much easier!